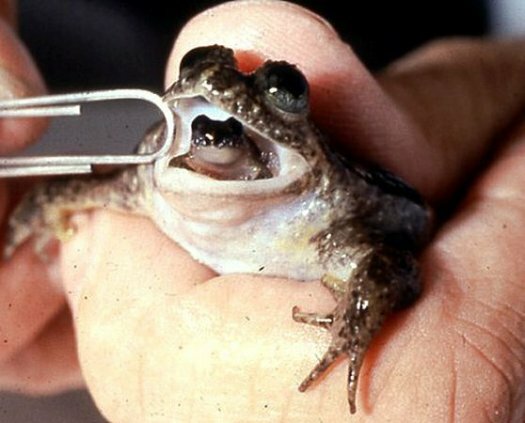 That there was ever actually such a thing as a “gastric-brooding frog,” a formerly extinct species that incubated their eggs in their stomachs and gave birth through their mouths. Holy crap! That scientists have brought these formerly extinct frogs back to life. That, regardless of how disgusting their method of reproduction is, the tiny baby frog in the mommy frog’s mouth in the photo here is actually kinda cute. Fascinating to think about the implications of this development, the ethics behind bringing back extinct species, whether or not this is a dangerous slippery slope on the way towards scary CGI action-adventure movies, or worse, the real thing.